Get ready to pack your picnic bag, put the top down and cruise through California's coast. What better way to begin your Napa Valley getaway than with some off-the-grid visits? Although off the beaten path, you really needn’t look too far to find unique experiences around stunning Napa Valley. We're giving you the best suggestions off the beaten path. Enjoy the drive, the beauty and the road less traveled. Sausalito, California is a small town of 7,000 people tucked at the base of the steep hills that ring San Francisco Bay, just north of the Golden Gate Bridge. While Sausalito is the gateway to the Napa and Sonoma wine regions, if you don’t have time to make it all the way there, or want to stop along the way, Sausalito can offer sips and bites that will take you there just the same. Even if you have been to Sausalito before, you've likely still overlooked some of the very best spots. While every restaurant in town offers a wonderful selection of California wines to please the palate, you can choose a less formal option and cozy up in one of the local pubs or bistros and enjoy Sausalito’s signature hospitality. Insider's Tip: Enjoy a uniquely inspiring luxury retreat at an intimate Sausalito waterfront hotel with 31 rooms and suites in a magnificent location. 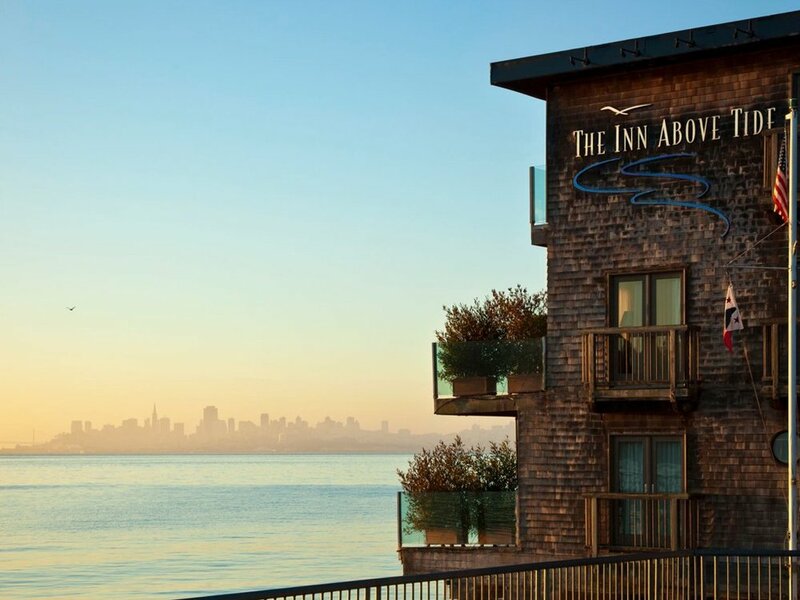 Panoramic San Francisco Bay views are the signature of The Inn Above Tide. Chic interiors lead to simply mesmerizing views from the private furnished room decks. Sited directly on SF Bay, every room has sweeping views of the bay, city skyline, Alcatraz, Angel Island and Marin. The spectacular but brief ferry ride to SF is just steps from the hotel. Intimately connected to the village of Sausalito, yet magically separated due to its bay front setting, The Inn Above Tide is a minute’s stroll to galleries, restaurants and shops. The scenic vineyards of Sonoma and Napa are just a short drive north. We know atmosphere is everything, so why not enjoy fresh oysters overlooking the water in which they grew at Hog Island Oyster Co. on Tomales Bay. They grow, harvest, shuck and share great oysters on the coast of Northern California. Enjoy one of these oysters from its shell, and you'll understand why they're so passionate about what they do. If you can't make it to the farm in Marshall on Tomales Bay, visit the bustling oyster bars in San Francisco's historic Ferry Building or downtown Napa at the Oxbow Public Market. Insider's Tip: Making a reservation is highly recommended. Nick’s Cove Restaurant, Oyster Bar & Cottages is the perfect coastal escape, just over one hour from San Francisco, a scenic drive past the rolling farmland hills and scenic coastal views of the legendary Pacific Coast Highway. Its nostalgic roadhouse charm, and the untouched coastline of Tomales Bay will transport you to a world of quiet comfort and tranquility. Nestled in the serene, sheltered coves of Tomales Bay, the cottages at Nick’s Cove combine rustic charm with luxurious comfort and offer an elegant and cozy hideaway. The picturesque setting and tranquil waterside evenings make it the perfect place to unwind and refresh yourself. Nick’s Cove Restaurant and Oyster Bar is a destination restaurant for award-winning cuisine in one of the most beautiful coastal settings in all of California. The natural beauty and abundant farm produce of the West Marin coast inspire chef Joshua Seibert’s seasonal, sustainable and delicious California cuisine. Their menu is sourced from local dairy and produce farms, and the fresh seafood of Tomales Bay and nearby waters, and is the very essence of farm-to-table cuisine. This gorgeous glass-decked restaurant offers an amazing view at every table. For a more casual option, wander down the pier to the "shack" and you can order food and drinks from the landline as you enjoy the fireplace and views of Tomales Bay. Insider's Tip: Your cell phone won’t ring out here – but they have land lines if you need to make a call. It's 30 minutes to the nearest filling station, so make sure to fill up your tank before you head out. Join the Nick's Cove Crew for Locals' Night every Tuesday of the month and enjoy live music and a specially prepared menu. River’s End Restaurant & Inn is perched on a bluff overlooking the mystical Russian River entering the great Pacific Ocean. Located one hour and 45 minutes north of the Golden Gate Bridge, this haven for lovers of the Sonoma Coast and wine country has been around since 1927. Originally built as an inn for fisherman, the River’s End now serves guests looking for the ideal romantic dining experience or just searching for renewal in one of our cabins. The property features the unplugged experience with no cell or internet access, making it the ideal place for rediscovery, renewal or just celebrating life. Insider's Tip: Whether you like to start your day with an espresso or pastry, the area provides plenty of local breakfast spots. Head down the street to the village of Jenner for an amazing cup of hand-brewed coffee at Cafe Aquatica. Sipping coffee on the Aquatica deck is as close to the Russian River as you can get without a kayak. Begin your wine tasting afternoon with the Fort Ross Winery, located high on the coastal ridges just five minutes north of Jenner. You’ll sip 100% estate grown vintages in a rustic barn-style building that is the first and only tasting room in the new Fort Ross-Seaview AVA.